1. Environment isn’t a glamorous field like Technology. It doesn’t bear shiny fruits. It doesn’t make you rich. All it ensures is a healthy living environment for future generations – which is nice to talk about but a rather bland career option. For a fast growing economy like India – clean air and clean water – don’t figure into the immediate list of priorities. Not just India, but the whole world is more obsessed with the new toys that technology produces everyday. Conserving environment however asks for restraint in developmental pace which is a complete no-go. Even from man power perspective how much of the young blood is ready to venture into the environmental fields? Where everybody wants to become a technocrat, nobody wants to become an environmentalist. 2. Health sector figures before environment because its importance is more visible. Medicine research gets ample funds. From political angle too health is a better selling point that environment. Prima facie environment seems to stand in the way of development, which everyone so desperately seek currently. Govt is ready to invest in curing the diseases, than preventing them by giving more attention to ever degrading environment. What everybody seems to miss that foundation of good health stands on good environment – and unless it receives solid support at policy level no level of awareness will bring any long lasting change. 3. Environment is all around you so nobody seems to notice it’s degradation. To the people busy with their day-to-day lives environmental issues are invisible. What everybody misses that gradual destruction of environment impacts everybody’s long term future, if not immediate. Environmental awareness directly corresponds to education and hence the earning capacity – that’s why richer, more influential individuals generally live and move in a better pollution-free environment. Therefore environmental degradation doesn’t concern them much, besides in an ideal-world scenario like “there should be more greenery and less pollution…” – at the same time their lifestyle might be putting a heavy load on environment elsewhere. Those who’re less fortunate and are less environmentally aware due to lack of education have no option but to try and survive in more polluted surroundings. Though, these people too don’t care much about environment either – and contribute heavily to pollution – mostly because they don’t have the luxury to do things differently. 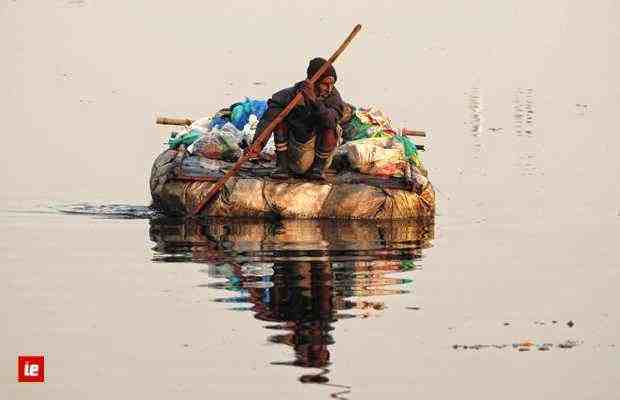 Poverty combined with attempts at mass development always puts a load on the environment. But instead of sharing the burden – in India, everybody chooses to look the other way – as if being in denial will make the problem disappear. 4. Like in most capitalist economies – governments in India are owned by the corporates. Most policy decisions are taken through lobbying to advance financial gains, a lot of times at the cost of environment. Activism against corruption is already in motion, yet environmental activism hasn’t quite taken off. Reason for that is that people still don’t see environmental degradation as an emergency. Those who’ve the means to contribute to this cause are happily cocooned in their air-conditioned rooms, occasionally step out in the evening to water their terrace gardens. 5. Environmental causes are left to Foreign Funded NGOs, Environemental Ministry (who nobody listens to) and the Supreme Court. Environment won’t figure into your local government’s agenda unless it figures into your list of priorities. Our minimum program driven, coalition powered, pseudo-socialist, corporate fueled governments will never take the unpopular decisions to improve environment. They won’t reprimand the rich polluters for money and poor polluters for votes. Those who struggle to barely pay their electricity and water bills won’t stand up for environment. The responsibility lies upon those who’re aware and fortunate – to bring the issue of environment in the forefront. 6. Everybody knows there should be more trees, but how many of us have planted trees with our own hands. Environmental good deeds have become a list of cliches. Nobody bothers about them. In free market everybody does what has the best incentive. While Environment doesn’t provide any immediate incentives. The idea of a community approach towards improving environment always fails because in developing countries people are so self-preserving that their community ends within their immediate family. In India, a socialist, governmentally owned yet publicly accountable approach to improving environment is the only solution. As a policy, environmental issues needs to be brought up the ladder – even if they’re inconvenient. The whole idea to bring environmental awareness, so people will take care of it themselves is flawed. It’d have worked otherwise. 7. Taking care of environment puts us directly opposite to our targets of growth and prosperity. Hence, it requires a very delicate balance between industrialization and environmental conservation. Western countries could develop putting load on environment because their population was less. But India fails in that aspect as well. We have a huge population – we’re not developed yet and we’re already a big burden on the nature. What we need is political will and scientific creativity. Our situation is extremely tricky, but fortunately not unsolvable. Execution of environmental policies won’t be complete unless they’re well thought out. For example, when you ban the use of polythene bags – it is also your responsibility to make alternates readily available. You could ask them to use jute / paper bags to carry groceries – but how do they dump the daily trash? This is where the policy decision of banning poly-bags fails. Since it’s not executable nobody executes it. And people still use poly-bags. This is the story of Delhi. People won’t become responsible and find creative solutions themselves. This is why they elect a government, not so it frames uncomfortable rules for them to follow, but to find solutions. 8. Environmental education in India is incomplete unless it’s practical. Environmental studies are a part of Indian syllabus – but all it covers is why pollution is a problem and plants are important. It also covers what should be done but it doesn’t cover ‘how’. Education system in India needs to inculcate good environmental practices in the behavior outside the examination hall. Writing ten points to improve environment in the social studies paper won’t improve the environment. Schools could actually take practical hand-on projects where they could teach young minds on reducing carbon-print from our daily lives. This is just one example. A lot can be done – but it’ll require effort and will. 9. Growth, growth and more growth – from Equity to GDP to Technology to Business – this’ll remain the main focus of India for at least coming 50 years. The growth oriented policies will put great pressure on our rainforest, atmosphere and rivers. Like we allot quotas for our backward classes, so they’re not left behind – environment needs to be given a special status in India. This is the need of the hour. We need to be very conscious of the fact that it’ll become a real survival of the fittest (or richest) situation India, if environment is allowed to degrade at the same rate for the next five decades. 10. Improving Environment will never become a popular endeavor – as a matter of fact the process could be fairly irritating as it uproots the existing system. A responsible government would have to take tough yet creatively enforceable decisions to bring change in how things work in India. For more manpower, environmental studies need to be made more lucrative career choice. When we’ll have more people earning their living to improve environment, things will change. More incentive oriented programs need to be started to bring community participation. Science need to be levied to promote cleaner sources of energies. Technologies are available – they just need to be harnessed and made mainstream. Attitude needs to be nurtured where everybody shares responsibility of taking care of the environment – which first need to be initiated at the local government level. Environment is a tough cookie to crack. Government will become active when we, the people, decide to make environment a priority. While most know that India’s environment is degrading every second and future will be tough – nobody seems to have an answer. Most put the responsibility to conserve environment on others, than share it. We need to quit pointing fingers – and take responsibility of the environmental destruction so far. It’s us, it’s you, everybody contributes to it.